Whatever your profession may be, there are experts on Linkedin, Facebook, Twitter and other outlets effectively sharing their insights & ready to engage in meaningful conversation and collaboration that drives their professional value forward. HR professionals are no exception, and many successful professionals and organizations are harness the power of social media to not only further the authority of their organization, but to bring on top talent as well. Interacting within HR LinkedIn groups, Twitter chats related to SHRM, as well as personal Facebook posts for job openings all have multiple benefits for networking and hiring. Groups on LinkedIn and other social platforms are a great way to stay on top of the latest trends and new developments in HR, as well as interacting with potential candidates that could be a great cultural fit for your company. Not to mention, when an HR professional projects value and authenticity on a social media forum or post, your company benefits as a top resource for not only premiere employees, but encompassing a well rounded digital presence for future success. Social media changes HR, forcing them to consider technology and the online conversation in everything they do. Conversations between HR and senior executives can no longer be avoided. Social media changes HR. Social media is engagement. Social media changes everything that is traditional. How does an actual HR professional utilize social media for their profession? Let’s ask one! This is Katie. Katie is one of our ideal HR Generalists in the field. Like many HR professionals out there, she utilizes multiple tools and strategies to project herself as a professional. Katie is well versed in the salary requirements and duties associated with her position, as well as the value of social media. Her level of experience would give her a great edge over many other candidates in the market. Need a great candidate like Katie? We have plenty of HR Generalists like Katie who are ready to work for great companies like yours. By offering the right compensation to the right fit, your company can better aim toward success. 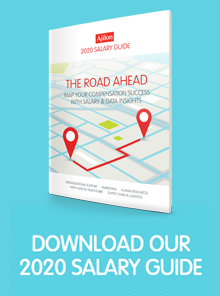 We can help you by not only finding you the right candidate, but we can also equip you with the right salaries and job descriptions included in our brand new 2015 Salary Guide. Don’t let top talent slip through your fingers because of incorrect salary numbers. What is blockchain technology and how does it impact human resources?